Lenjoy 1 Day Comfort are daily contact lenses by Supervision Optimax, which adopt the most modern technology with research and development from the United Kingdom. The high quality of Lenjoy 1 Day Comfort contact lenses offers amazing visual performance, long-lasting wearing comfort and optimum health for the eyes. With their biologically compatible hydrating technology, non-slip surface, UV radiation protection and light-blue tint for easier manipulation, the Lenjoy 1 Day Comfort contact lenses are your smartest choice. 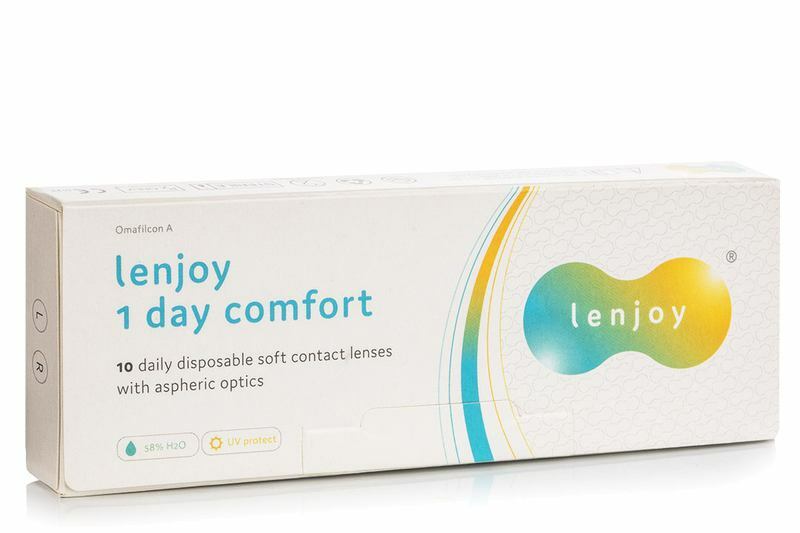 Lenjoy 1 Day Comfort contact lenses have high water content, which is crucial for comfortable wear. They are made with exclusive moisturizing technology that binds water and keeps the lenses fresh and hydrated throughout the day. The lenses create a hydrogen bind with water so that the molecules become part of the lens and prevent dryness. Their unique design is characteristic for its double-thinned edge, which allows for water and oxygen circulation around the eye. The lens stays in place and there’s no uncomfortable rubbing against the eye lid when blinking. The risk of irritation is thus minimized. The unique aspheric design of the lenses lowers the aspheric aberration and helps vision acuity even in awkward light conditions, for example while driving at dusk, working at a computer or during sport activities that require quick focussing. Another advantage of Lenjoy 1 Day Comfort lenses is their high protection against UV radiation thanks to the 2nd class UV filter which means that the lenses block 87 % of UVA and 97 % of UVB radiation. Lenjoy 1 Day Comfort's UV filters enhance the protection of the cornea from the negative effects of ultraviolet radiation. However, since contacts do not cover the entire eye area, it's recommended to wear sunglasses with UV protection.